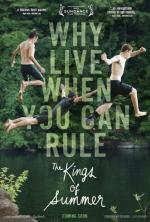 Like the fading of day into twilight, the ephemeral nature of youth is deftly captured in The Kings of Summer. The coming-of-age film is poignant and comical, sitting squarely on that threshold, focusing on the time when a teen is part boy, part man and all adolescent. That transitional period is encompassed in a pivotal summer.